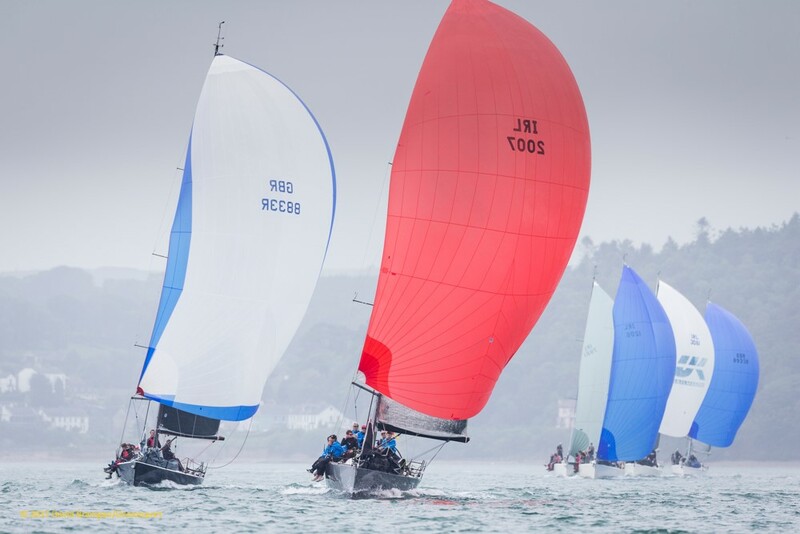 All seven divisions had a full schedule of races on the opening day of the ICRA National Championships on Cork Harbour this afternoon with close racing and surprises in several fleets. Of three defending champions present, just one is currently on course to retain a title. 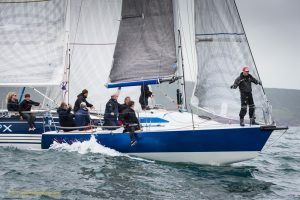 ICRA Boat of the Year and defending Division 1 champion Joker 2 skippered by John Maybury of the Royal Irish Yacht Club is set fair for a hat-trick this weekend after winning both yesterday’s races under IRC while also leading under Progressive ECHO. 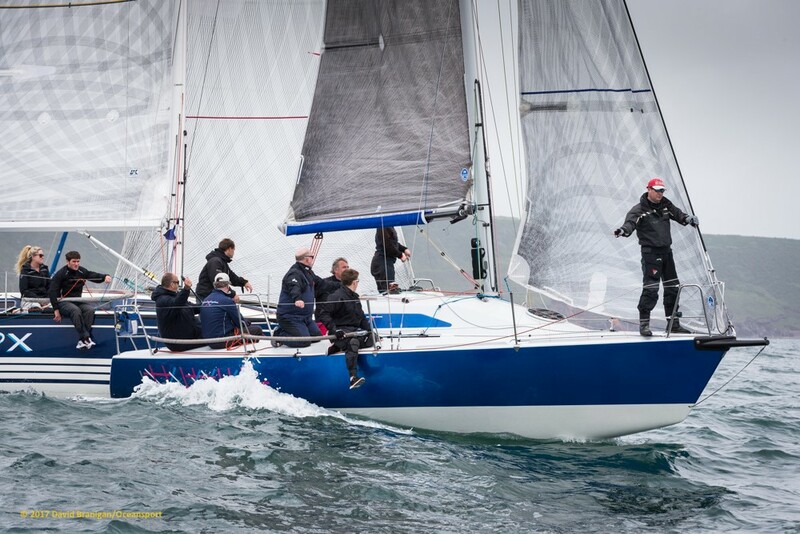 Division 1 shared a start with Class Zero where defending champion Conor Phelan from the RCYC went head to head match-race style with Tony Ackland’s Dark Angel from Swansea. The visitor gained the upper hand in race one, winning the first shift and covering the local boat around the cans inside Cork Harbour. Phelan’s crew led on the water in race two but were unable to open sufficient separation in another close race and the visitor took two bullets for the day on IRC. 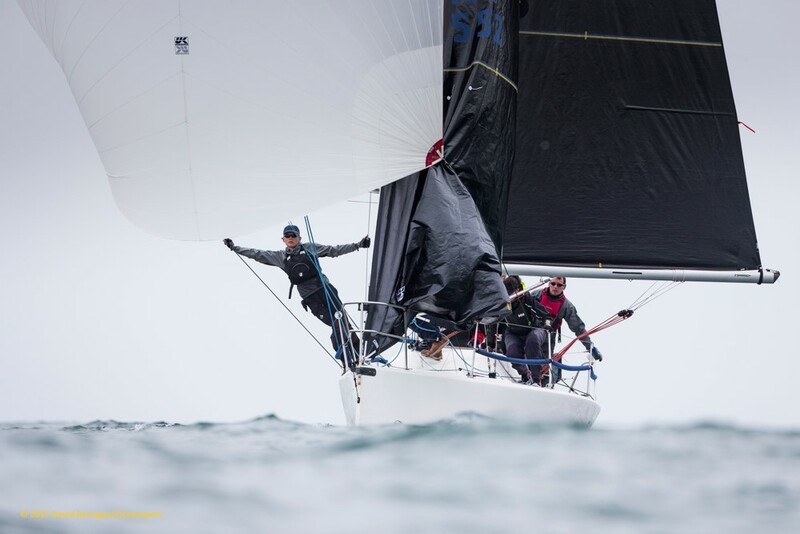 The lighter conditions south of Roche’s Point for the other divisions saw David Cullen’s Checkmate XV slip to fifth overall on IRC handicap placing his title defence under pressure. Jonny Swan’s Harmony, another Half-tonner from Howth YC leads the division on both IRC and Progressive ECHO but this eight strong fleet is tight with just a three point spread from first to fifth places. If racing can be held in the weekend’s forecast high winds, Cullen may yet find the edge to retain his title. Paul Gibbons Anchor Challenge leads Division 3 overall, both on IRC and ECHO after two solid wins yesterday leaving Howth’s Richard Colwell’s Fusion and Anthony Gore-Grimes’ Dux to hold both runner-up places, split on tie-break at the front of the ten boat division. Former national champion Flor O’Driscoll with Hard On Port from the Royal St. George YC is proving hard to dislodge from his favourite status in Division 4 where J24 footers hold the top seven places under IRC handicap. Racing in ten knots off Roche’s Point saw the Cobh sailor prove the worth of consistency with two second places for the day while Foynes Daragh McCormack with his newly acquired Stouche is looking like his main challenger after finding form with a win in the second race of the day. Amongst the White Sails fleets, Denis and Anne-Marie Murphys’ Nieulargo, a Grand Soleil 40 tops the A-fleet ahead of a pair of J80’s while Clodagh O’Donavan’s Roaring Forties, a Beneteau 35s5 leads the B fleet, both on ECHO handicap. Meanwhile, Principal Race Officers Jack Roy and Peter Crowley are expected to wait until Saturday morning before making a decision on racing for the day in light of the the Near-Gale conditions forecast. If racing off Roche’s Point is untenable, there may be an option to sail some or all of the divisions inside Cork Harbour.